Do you know what Picasso, Mozart, and Kobe Bryant all have in common? They were all masters in their craft1. Picasso is known for his creative masterpieces. While Mozart learned how to master the art of composing beautiful melodies2, and Kobe is admired around the world for his ability to control the basketball court. It is common to believe that people such as Picasso, Mozart, and Kobe Bryant, were just born with these gifts of natural talent, but if we examine3 their life deeper we discover that they put hours and hours of time to become the best at their craft. They knew exactly what they wanted to improve in themselves, and put in hours of hard work, sweat, and tears, without any recognition. Kobe Bryant wouldn’t be known as one of the greatest basketball players of all time, if it weren’t for his routine of waking up at 4 am to exercise and work on his fundamental4 basketball skills. No one even knew of Mozart or Picasso until around 10 years after they started in their areas of art and music. If you want to level up your skills in any area of life, it takes time, hard work, patience, and persistence. The same goes for your English. You won’t master English overnight, but once you have figured out how to live your English every day, “deliberate practice” is a technique that can help you break through plateaus5 and conquer your English. But, what is deliberate practice you may ask? For example, when Kobe Bryant goes to the gym to practice basketball, he doesn’t leave until he makes 800 shots. In this case, he has a clear goal of improving his shooting skills while he is in the gym. Every shot gives him feedback7 of his shooting technique. Each missed shot shows him that he needs to make small adjustments in order to improve. He’s not just spending time in the gym. There is a deeper purpose behind his practice. Although it is important to find ways to live your English along your journey to RealLife fluency, it is even more crucial to schedule time to live your English deliberately if you want to level up your English skills and reach the stage of mastery8. Reflect on the areas of your English you would like to improve, and schedule time each morning or at night to focus on your skills. It could be anything from writing, reading, listening, pronunciation, vocabulary, or grammar. Take the time each day to concentrate 1 to 3 hours on the abilities you really want to grow and improve. Throughout the process, look for ways to get feedback from your practice, track your results, and search for teachers or coaches that can give you guidance. If you want to unlock9 your true potential as an English learner, deliberate practice is a key habit to your growth and success. In this article, you will learn a few essential English exercises that will help you practice English in a more deliberate way. Remember to schedule these exercises into your day during a time where you can practice with complete focus and away from outside distractions to disturb you. Mimicking is a really useful practice to improve your English listening and pronunciation skills. If you want to take your conversational English skills to the next level, this is a very effective exercise to help you improve your accent11, intonation12, rhythm13, and sound more like a native when you speak. The exercise involves watching a video such as a TED Talk and repeating each phrase that you hear. TED Talks are amazing resources because you get the chance to learn from world class experts and each video is accompanied14 with a transcript of the entire speech. It helps to do this exercise on your computer and use your cell phone microphone to record yourself. If you would like, you could walk through this exercise using the following TED Talk on How to speak so that people want to listen by Julian Treasure. Get started by scheduling a dedicated time to practice mimicking. Next, choose a TED Talk that you are interested in practicing with. There are so many options on the site, but it helps if you choose the video based on the presenter’s accent (the way they speak) and your interest in the subject they are talking about. In this case, you could practice a British accent while learning about how to improve your presentation skills. Afterwards, watch the TED Talk for the first time while following along with the English transcript15. Try to see if you can understand the general idea of the presentation. Did you hear any words or expressions that you are unfamiliar with? For example, in the second section of his talk, do you know what Julian means by the “seven deadly sins of speaking”? Write whatever you don’t understand down on a piece of paper while you watch the video, and once the video is finished, figure out the definitions using the context of the presentation and an online dictionary such as Google Dictionary. If you want to know the definition of popular slang16 expressions that you can’t find in a normal dictionary, check out the Urban Dictionary. Now that you understand the TED Talk, it’s time to dive into the mimicking exercise. Go back to the beginning of the video and watch it again. This time, choose a short, one minute section of the talk that you would like to focus on. Start the video with your cell phone’s audio recording app turned on, and after each line try to imitate17 what the speaker just said while recording yourself. Pay attention to their accent, intonation, and rhythm, trying your best to mimic what they say. For example, start by imitating one line at a time while recording the audio from the TED Talk and yourself. Listen to Julian as he says, “The human voice: It’s the instrument we all play.” Then afterwards repeat this sentence that he just stated in the video. After you finish mimicking the one minute section, listen to the recording and compare your voice to the speaker’s voice. Just like a high-level athlete like Kobe Bryant, go back and analyze your performance. See which parts of the TED Talk you had difficulties imitating, and which parts you were able to mimic well. Once you feel confident with your performance, move on18 to the next one minute section, repeating the same exercise until you finish the video. If you can, send the recording to a friend or English coach that can give you feedback on your mimicking performance. A good goal for yourself would be to imitate one TED Talk per week. This is a very effective exercise to improve your English pronunciation fast. As you do this mimicking exercise, you will tune your ear19 to the specific sounds of English and the language will become more natural to you. In no time you will be speaking English like the native experts that you listen to in the TED Talks. This is a video sample from the Fluent with Friends course, which offers a lot of tips, strategies, and materials to help you mimic native speakers. If you want to improve your writing skills in English, you have to write every day. Your writing won’t magically improve itself on its own. A simple way to practice writing in English every day is by keeping a journal. The American author, Julia Cameron, has a journaling exercise called “Morning Pages,” that has become widely known across the world for its ability to help people improve their writing skills and how they feel every day. The Morning Pages exercise starts when you wake up and are getting ready for the day. She explains that you can start the day off strong by writing three pages in your journal. If three pages sounds intimidating20, try to write one page to start and work your way up to three pages. On your Morning Pages, write down anything that is on your mind. It could be things that you have to do today, dreams, how you are feeling, what you are grateful for, something you are worried about, something good that happened yesterday, or any other thoughts that you can’t stop thinking about. The purpose of this exercise is to practice writing down all your thoughts, both positive and negative, in order to clear your mind and help you think in English when you wake up instead of your native language. Writing down negative thoughts and feelings allows you to leave the negativity on the page instead of carrying it around with you and spreading it to other people. Go the extra step and type your Morning Pages in the computer, and then use an app such as Grammarly to get feedback on your writing mistakes. After you edit and make corrections to your writing, share your favorite parts with a friend or English coach, and ask them to give you feedback on ways that you could improve. You could even use your Morning Pages to start a blog and see how your audience responds to each article that you post. If you take about 15 to 30 minutes a day to write in English, you will soon see major improvements in your writing ability. Creating a daily writing practice such as the Morning Pages will help you take the vocabulary and grammar that you learn and use it in a practical way that will help you improve your self-awareness21 every day. If you are interested in taking your English vocabulary to the next level, Anki is a vocabulary learning app that can help you get there. It uses interactive flashcards to help you remember new vocabulary. Anki’s scientifically researched algorithms22 simplify the process of memorizing23 and retaining24 new vocabulary in a short amount of time. It gives you instant feedback on the words that you have mastered and the ones that you need to continue to work on. Also, since it’s available on Android or iPhone you can review vocabulary anywhere while on the go. Anki’s algorithms follow the principle shown in the graph above. Over time you will start to retain the vocabulary that you study in the app. Instead of forgetting words, they will become a part of your permanent English vocabulary. 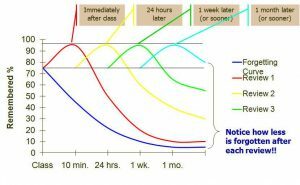 Creating a daily practice of sitting down for 15 to 30 minutes to review vocabulary is an essential habit to form if you want to master English. You could schedule a time in the morning, after lunch, or before bed to work on your vocabulary. Fortunately, there are a few really useful exercises within Anki that you can use to improve your English vocabulary. Check out this article where we dive deep25 into how to make the most out of this practice. Although Anki is great, and the RealLife Native Immersion Course uses Anki to teach over 800 new vocabulary items, there are a few other tools that are similar, like Memrise (which we also use for our Fluent with Friends course) and Quizlet. 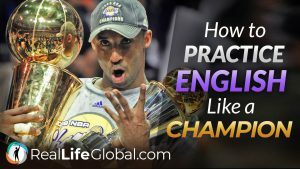 Now that you know WHY it is important to practice deliberately, and a few exercises that show you HOW you can do it every day, it’s time for you to start practicing English like the champion you are. It’s going to take hard work, effort, perseverance, and persistence, but in the end it will be completely worth it when you can tell yourself that you gave it your all and conquered your English. Don’t just show up to learn English, live it deliberately! Make it your both your craft and calling. Continue to level up until you reach mastery status through deliberate practice, and who knows, maybe one day you will be the one guiding others along their journey to RealLife English fluency. Are you ready to accept your call to adventure and take your English skills to the next level? Download a FREE copy of the RealLife English Manifesto and get started on your journey to English fluency! Thanks Marco! Yeah be careful of what habits you form.